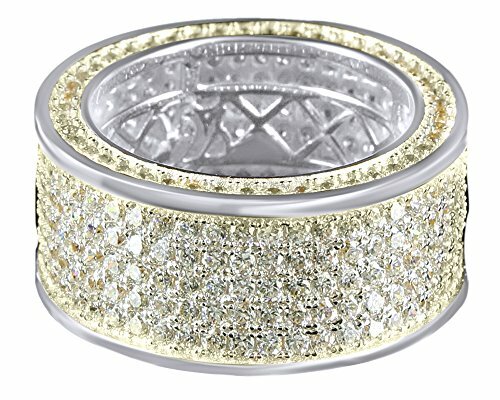 Jewelry has the power to be this one little thing that can make you feel Unique, Youre going to love this Fabulous White Cubic Zirconia Anniversary Band Ring In 14k White Gold Over Sterling Silver Simply beautiful! Makes a great gift for any Christmas, party, wedding, graduations, Mother's Day,Anniversary, Engagement, Wedding, Birthday, Holiday, Promise, Valentine's or Special Occasion! Crafted - in High-Quality 14k White Gold Over Sterling Silver S925 stamped that delivers exceptional shine & ultimate protection. We customize ring as per you size. Available: 4, 4.5, 5, 5.5, 6, 6.5, 7, 7.5, 8, 8.5, 9, 9.5, 10, 10.5, 11, 11.5, 12, 12.5, 13, 13.5, 14. If your ring size is not listed, please email us with your size once you have placed your order.